YOU ARE NOT GOING TO LIVE 1000 YEARS! STOP WASTING YOUR AMAZING LIFE BECAUSE YOU WON´T BE BORN AGAIN! In this guide, you will find 7 actionable and highly effective anti-procrastination techniques and strategies you can use to break the bad habit of procrastination for good, start taking MASSIVE ACTION, and successfully achieve all your goals. TAKE ACTION NOW AND BECOME A SUPER PRODUCTIVE PERSON! GET THIS LIFE-CHANGING KINDLE BOOK NOW!!! The book is a quick read that will give a precise blueprint on getting your life in order. If you are the type who is always getting distracted and missing deadlines or waiting until the last minute to do your report, this book was written for you. I gave it five stars, because it gave me a plan that works. It was like a getting a quick brush up on my old college project management course. Highly recommended this book! The author provides easy to follow strategies to transform our perspective and improve our quality of life. 2nd Strategy - Change Your Work Environment, this what I need now! 5.0 out of 5 starsInformational! Enlightening! 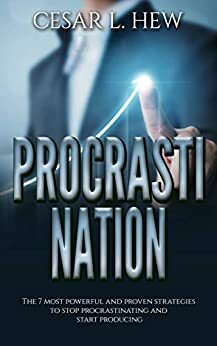 The main thing I liked about this book is that not only does he tell you what to do to beat procrastination, he tells you HOW to do it, step by step. Thats the REAL meaning of a self help book! Well done! I read a lot of self-help books on the topic and follow a productivity regimes, yet I find it hard to concentrate on my most important tasks and goals. This book gave me a quick and concise reminder of what I have to do to keep myself from succumbing to all the distractions - all the "noise" that's preventing me from achieving my goals. While reading, I took notes of the ideas that most resonated with me, and perhaps it is not by chance that today I accomplished one more hour of productivity than my usual average. In addition to the valuable content, the book is very well written. Pros: 1)Excellent tips for those who are having difficulty getting past their own procrastinating. 2)It's an easy read, short and to the point. Cons: 1) Should have used an editor as there are several mistakes that are a little jarring for the reader. Overall, aside from the editing mistakes the short book is worth the time for anyone looking to improve themselves. Good advice and value for the money.